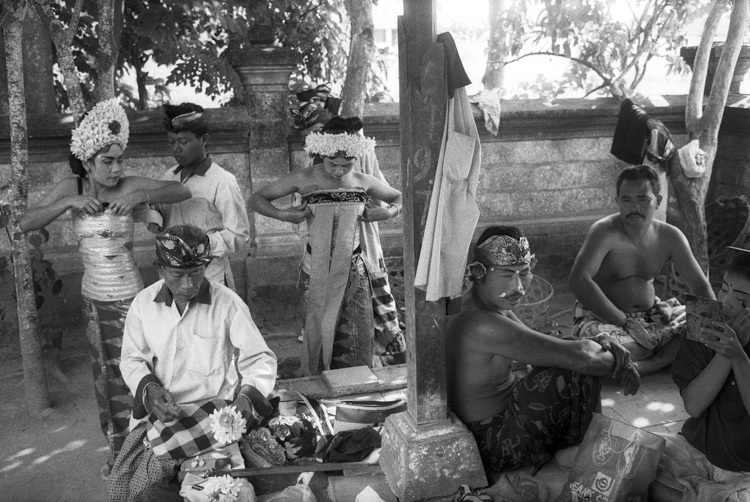 INDONESIA - When I got the assignment from a magazine to travel to Bali to spend two weeks documenting the culture through its rich history of music and dance I was ecstatic. After a long trip to get there I parked myself in a small guesthouse in Ubud, situated in the upland hills in the center of the island and surrounded by rivers and rice fields, away from the throngs of beach seekers that fly in daily and fill the tourist centers on the south coast. There was a lot to explore and one day I came across this scene of actors preparing for an outdoor midday concert of theatre, music and dance. The crowd was local and the participants were farmers on their lunch break.